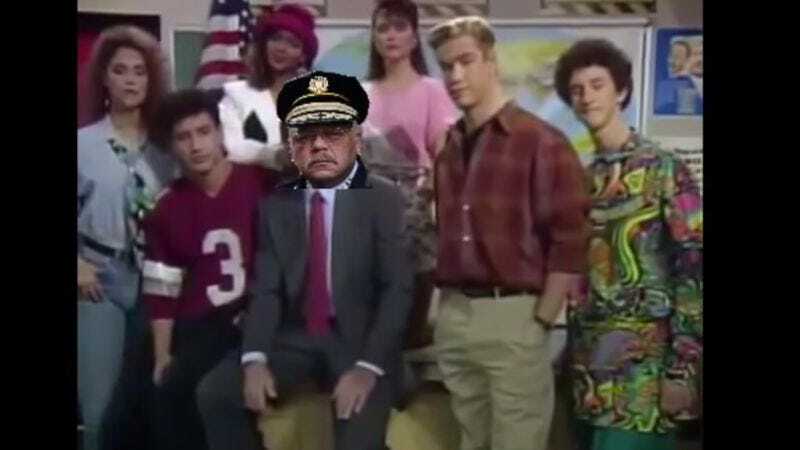 Last week, the Philadelphia Police Department released its latest anti-drug public service announcement, which is actually an old PSA taken from an episode of Saved By The Bell entitled “No Hope With Dope.” But where the original was produced by NBC and ended with then-network president Brandon Tartikoff agreeing with the Bayside Teens that there is, in fact, no hope with dope, this version, seemingly made with iMovie, awkwardly places the current police commissioner’s face and name over Tartikoff’s. Firstly, it cannot be emphasized enough that this is a real thing. This was put out on the official Philadelphia Police Department YouTube page and linked on their official Twitter account. Secondly, what the hell is this? Why was this done? It could be seen as an attempt to go viral by the police department, but then why use an episode that aired 24 years ago? Who is this appealing to—people in their 30s and 40s who have probably already determined their feelings on pot? And if they are so stringent on marijuana laws, why are they not as strict about copyright infringement? But know this: When gazing into the abyss of the Philadelphia Police Department Saved By the Bell PSA, the Philadelphia Police Department Saved By The Bell PSA gazes back.